Welcome to the Lightspeed Retail Template Bootcamp! Here is where I'm going to show you a little bit about that magical thing software engineers and developers call "code". This is for the interested, the adventurous and the generally curious. 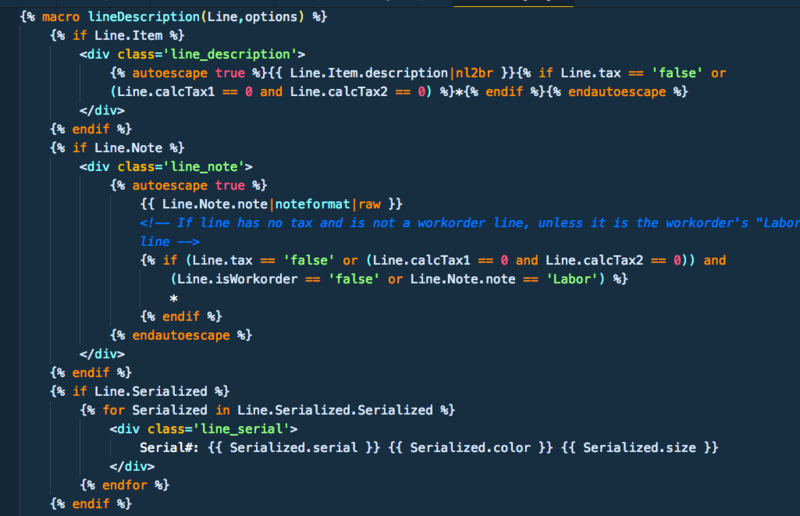 The world is run by code and your printed templates aren’t any exception to that rule. What we see on paper might just look like text, lines and images, but that finished product we enjoy is really a complex work of engineering born from the mind of passionate and careful minded individuals. But for now, I want us to think of code as a recipe. A set of instructions to accomplish something. This recipe, used correctly within an environment such as an oven, can help us make a lovely dessert. Used incorrectly produces the things that nightmares are made of. Baking isn’t rocket science, but a professional baker can do things that the amateur adventurist couldn’t dream of. The same can be said of coding. Within our toolkit is something called web languages, both programmatic and markup languages. This is how we communicate with our computer to tell it to do our bidding. A firm grasp of these languages enable you to describe to the computer what you want to achieve. We use these languages to accomplish what we want on the web. This is good news since Lightspeed Retail is a web application! I’m going to briefly describe how to “speak” these languages so we can make the computer do our bidding. These guides won’t make you a masterchef but they will on a basic help you understand how web works work and give you perspective behind common requests.